Doc Thomas House, South Miami, FL, March 27, 2004. This Moustached (Red-breasted) Parakeet was seen at the Doc Thomas House just before a TAS trip to Shark Valley. Like many parrots, it has more than one English name. “Moustached” is used by Forshaw and by Epps, but Clements and Sibley-Monroe call it “Red-breasted”. 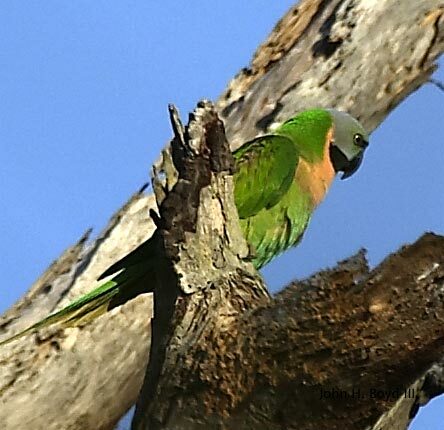 As the scientific name Psittacula alexandri indicates, it is related to the Rose-ringed Parakeet (Psittacula krameri). The black bill indicates it is a female.